Koala, what a cute nickname, my nickname in high school wasn't cute. They called me Double D, innovative huh? I carried a bright orange (I mean you could stop traffic with it) book bag in high school so no judgment here. I really enjoy going to museums actually, I can never drag my boyfriend to them "too much walking" he says. Pfft. Always good to read your entries so glad you're back. LOL at the last image! I love your nickname and I'm really looking forward to meeting you. I will also be talking to EVERYONE so no-one has to be afraid! I can't wait to meet you lady!! Your illustration is adorable. Really want macaroons now! Welcome back, have missed you! Ok, where the heck did you get your speech bubble ring?! I love it! I used to have a tigger backpack. When you squeezed his hand he said "gerr wankers!" (he didn't but it just sounded like he did!). Incidentally I was 20 & at a redbrick uni at the time. Oh the irony of students!! Looking forward to getting to meet everyone next wk! 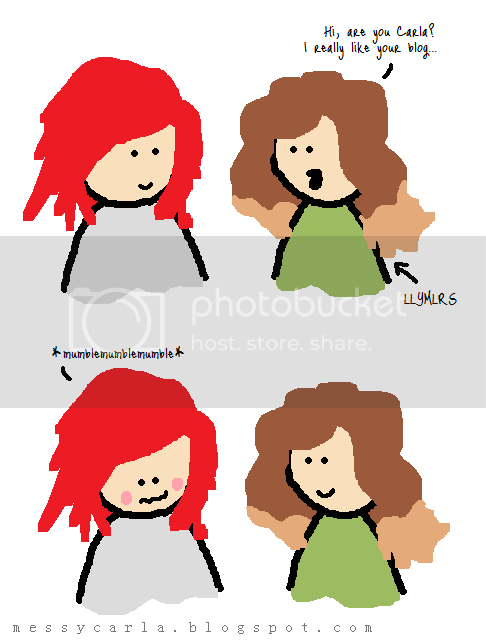 Love the drawing of you meeting Lily, haha! I bet the meet will be awesome! I'd love to attend one one day. And I agree about horses - wayyyyy too big. Same with cows. Ohhh your hair is stunning! Love, love love love love it <3! Damn, I want those macaroons. 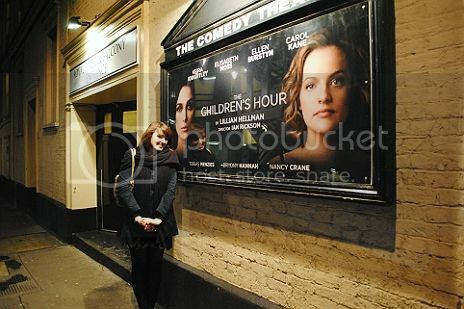 I really want to see The Children's Hour, mainly for Elizabeth Moss. I love her as Peggy Olsen in Mad Men. I used to love the Hancock museum as a kid, it's a bit too modern and high tech for my liking now! Haha, this post made me giggle multiple times. I'm happy you're back :), and excited to see photos from Plus London. I'm completely jealous of all of you going! 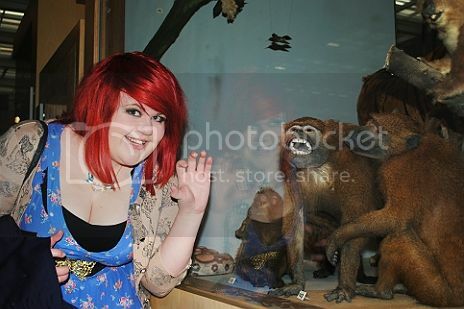 Love the picture of you and the monkeys and Lauren is so darling! I used to have a koala backpack! I never had the name to go with it, but I was obsessed with koloas, ahaha. 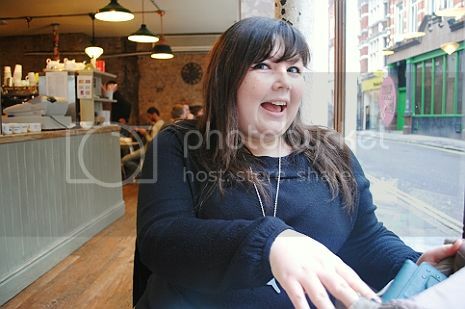 Ahaha, love the cartoon with you and Lily Melrose :D I'm looking forward to the pics of PlusLondon! heheee - that drawing is incredible. I'm definitely an awkward turtle too - fine with people I know, but a complete mute when meeting strangers! Have a fab time at the meet up - i'm sure it's gonna be 'mazin!!! 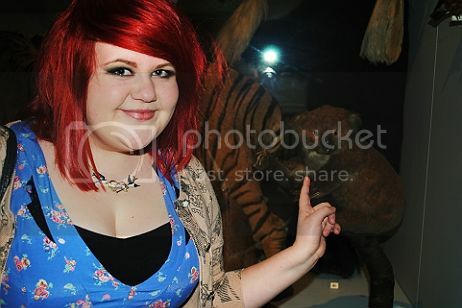 I love museums. I could wander round them for hours, I really could. Haha, nice nickname. 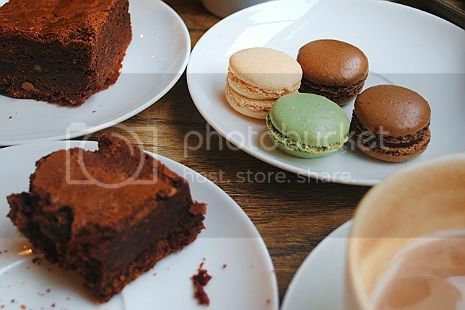 Those macaroons and brownies look to die for! 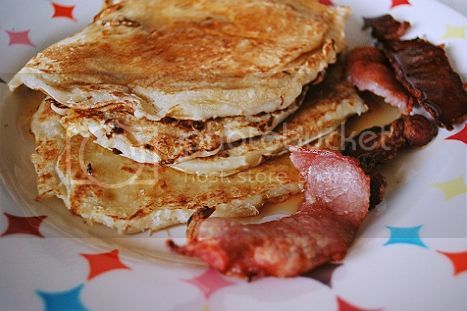 & Those pancakes, corr! I want some (: Hope you have an awesome time at the Plus London get together! so jealous of yours and laurens hang-outs! I wish i could be there, too! Save a seat for me to attend in spirit, next time. I hope plus London goes well, I wish I was less pathetic and could come. And WHERE did you get that ring in the last picture? I NEED IT! Glad your back to blogging! Looks like you have been having a great time! Beth ⚓ Anchor of Roses: Awww that's sweet of you to say - and you KNOW I *hearts* you too! Monkey: HA I had a tigger backback too - rawr, how punk?!! Tamara: Aww thanks about the hair comments - it's in need of redying! The macaroons were SOOOO GOOOD! Gemx: Haha I was such a dork...still am! Glad to see you posting again, can't wait to meet you this weekend! First of all, THERE IS NO REASON TO BE SHY TO MEET CARLA! Cos Carla is awesome and sweet and bubbly and did I mention awesome? And then, look at what I got in the Miss Selfridge Sale Carlita: http://www.missselfridge.com/webapp/wcs/stores/servlet/ProductDisplay?beginIndex=0&viewAllFlag=&catalogId=33055&storeId=12554&productId=2147650&langId=-1&sort_field=null&categoryId=208139&parent_categoryId=208126&sort_field=null&pageSize=40 That was very inspired by your blog, bit excited to be honest. the jacket in the first pic is just adorable!! Love your blog, you're adorable!! Definitely got yourself a new follower!